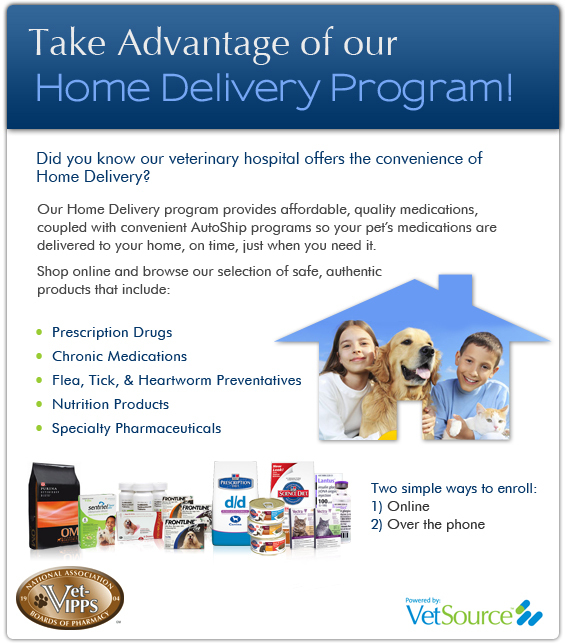 Wilson's Creek Animal Hospital is pleased to announce that our on-line pharmacy is now open and ready for business! To get to our online pharmacy, please click the icon below. This will take you to the pharmacy site. Once there, you will need to set up an account if you have not already done so. The set up is completely free to you. For new users, there will be a short wait while we confirm that you are an active client. Once that is done, you are free to browse the catalog, compare prices, and purchase items. any prescription purchases will need authorization from our clinic. This will be done within 24 hours. For those clients that wish to purchase single and multiple doses of heartworm and flea/tick prevention, and for immediate need medications, we will continue to stock those medications. *8/25/2016 - Please note, if you are an existing online pharmacy user, this is a new online pharmacy and you will need to make a new account at the new pharmacy page.